Do you want to get more out of your training? Here are 7 critical concepts to help you and your dog get the most out of your training sessions. Make training fun. This can’t be said too much. Start with fun. End with fun. Keep lessons short—stop before your dog wants to stop. Include lots of play into your training sessions. Keep rewards high—reward more than you think necessary. Train when you are in a good mood. Break down each exercise into all of its components. Train each part of an exercise independently. Then put them together as if it were a brand new exercise. Build up in very slow increments (think thin slices of behavior). Look for at least 80 to 90 percent success before you up your criteria. Go back periodically and reinforce the lower levels of learning. Take it on the road. Try for at least 30 repetitions in 30 locations to build a reliable behavior. Train the dog that is in front of you on that day! Don’t worry about what “should” work or what worked the last time you trained. Respect your dog’s individual nature. Build on your dog’s strengths instead of trying to change him. Pay attention to stress signals and triggers. Look for “good” stress (such as a play pal) and “bad” stress (such as something scary). Both can affect your dog’s performance. Train in low stress environments first, and then slowly build up so that your dog can work with increasing stress. Avoid other stress triggers such as too much social pressure in the early stages of any behavior. This promotes insecurity and will sometimes cause your dog to shut down. If your dog gets it wrong, go back a step where he/she can be successful. If your dog gets it wrong once, take note. See what you can do to insure success the next time. If your dog gets it wrong twice in a row, stop! Rethink the exercise. Remember if your dog gets it wrong three times in a row, he or she may actually be learning to do it wrong. Keep in mind that you are TRAINING, not testing. 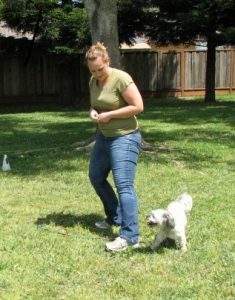 Make the exercises doable for your dog.